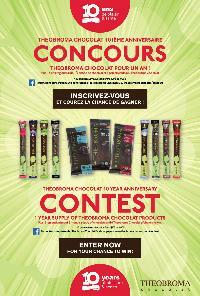 Prize: 1- year of Theobroma Chocolate products ($1,000). 2. 3 half-year prizes of Theobroma Chocolate products ($500/each). 3. 6 winners: gift basket awards filled with Theobroma Chocolate products ($50/each). Statistics: This contest was opened by 115 and entered by 25 ContestChest.com members. 22% of those who opened the contest, entered it.